A small portable banner stand that's inexpensive and easy to use. Can be set up in seconds. Measure 24"W x 62"H and the print material is 10 oz. econo gloss vinyl. Great for trade shows, exhibits and conference rooms. 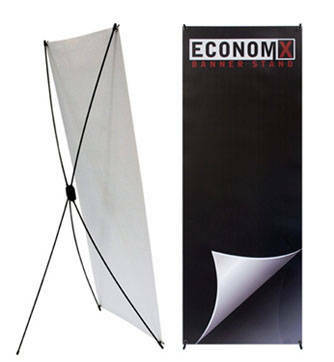 Economical, portable and easy to setup, the X Stand frame looks like letter X and is typically used for promotions where attaching the banner on the wall is not an option. The X Stand has one hub that supports flexible arms that attach to the corners of the banners - typically with grommets. The flexible arms create tension to hold the banner tight. The easel-like support leg allows the banner to be placed at an angle.